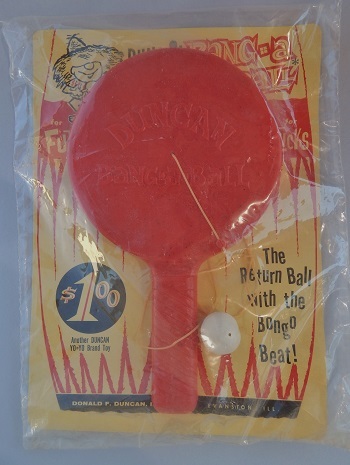 A paddle ball toy briefly marketed by Duncan in the early 60s. Marketed as the only return ball with an adjustable elastic band. Specially constructed hitting surface allow for faster return and greater control of ball. Notice the Duncan Yo-Yo Man character, donning a straw hat, used on the back of the package. Dale Myrberg, 1996 World Yo-Yo Champion, would simultaneously use a paddle ball and a yo-yo in his shows. It was a very impressive display of dexterity, hand/eye coordination, and trick inventiveness.